Marriage is the coming together of two people, and it is important that the couple’s outfits mirror this. 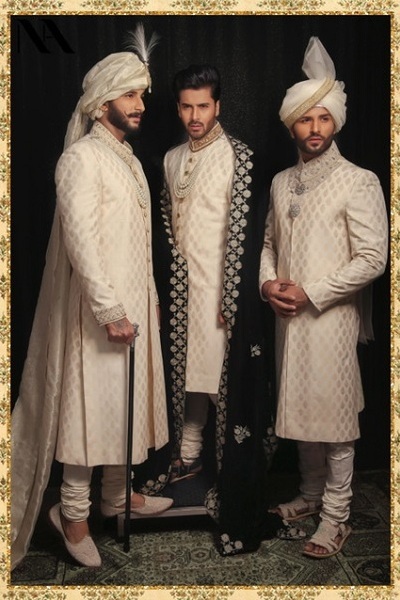 Here are a few pointers for men’s Indian wedding outfits. While you might expect a bride-to-be to be excited about shopping for her wedding dress, the same may not be true of the groom-to-be. However, with a little preparation, the groom can ensure that he is as well turned-out as his bride. The first thing to pay attention to, is the colour of the outfit. The right colour is one that complements one’s skin tone and offsets the bride’s outfit. Another important factor to think about is the fabric. Materials such as silk and velvet are good choices, but the groom will have to choose between ease of movement or luxury. Indian weddings are much more than just Indian designer wedding dresses. Today’s Asian weddings almost always boast exotic locations, exquisite designer trousseaus and elaborate events. With so many ceremonies making up the Indian wedding, the bride and groom have plenty of occasions to flaunt several outfits. Some styling tips that a groom could use on his wedding day include paying attention to the accessories for men’s Indian wedding outfits. A well-coordinated set of accessories such as cuff links, tie pins, footwear and so on add a dash of flair to the groom’s outfit. Today’s fashion-conscious groom can opt for the Indo-Western look, currently trending among Indian designer wedding dresses. Bold, daring and with a range of options in terms of style and designing, this look is sure to grab the groom a lot of attention. Slick and sophisticated, the Indo-Western look combines the sleekness and cut of Western wear with the old-world charm and grandeur of Indian attire. Whatever the look the groom is aiming to create, the most important thing to remember is that a wedding is an extremely intimate occasion. Choose a look that you are comfortable with, and savour the most important day of your life.